(StatePoint) Thirty-two million Americans are now living with food allergies, according to new data published by The Journal of the American Medical Association Network Open and Pediatrics. This equates to roughly one in 10 adults and one in 13 children (or about two in every classroom). What’s more, over 50 percent of adults and 42 percent of children with food allergies have suffered a severe food allergy reaction such as potentially life-threatening anaphylaxis. 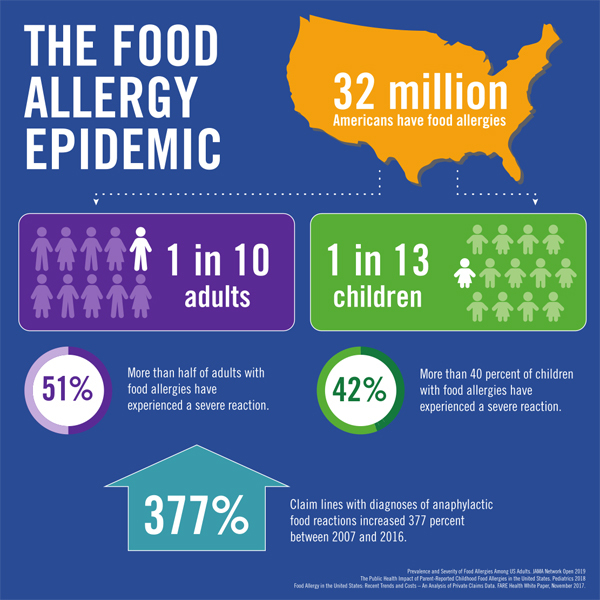 Food Allergy Research & Education (FARE), the largest private funder of food allergy research in the world, recently commissioned a state-by-state report analyzing the rise in diagnoses of anaphylactic food reactions between 2007 and 2016. The results illustrate the gravity of this growing epidemic, with a 377 percent increase nationwide. Advocates say that the increasing prevalence of food allergies demands action and escalates the need for new treatments and diagnostic tools that save lives and help alleviate the burden of this disease. To that end, FARE’s “Contains: Courage” campaign is seeking to raise a historic amount of money for research and education efforts. To learn more, visit foodallergy.org. Food allergies are at epidemic levels. However, new treatments and greater awareness promise to change the lives of millions of Americans.